Last week on South Park: Mr. Garrison is busy dropping truth bombs across America but his quest for the White House isn’t resonating well with some sects of society, specifically those with an 8th grade education or higher. Jimmy Fallon is directing jokes of a similar nature at the good people of South Park, as he makes light of the type of community that would give rise to such an outspoken redneck on The Tonight Show. 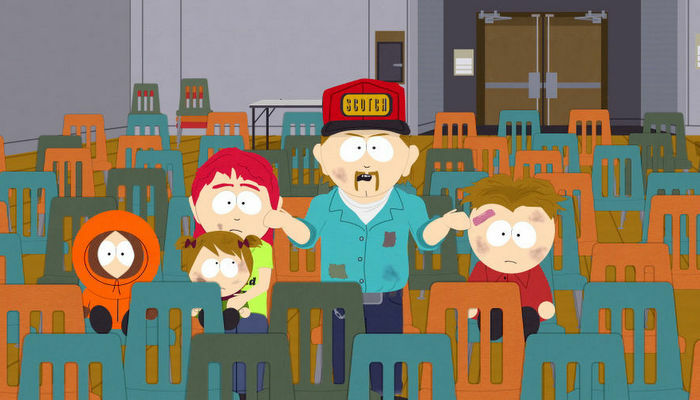 Butters is reduced to tears as he watches Fallon parody the state of education in his hometown: “Welcome to South Park University, open your shotguns and slap your wives”. Thankfully, local fluvial geologist Randy Marsh (aka Lorde) devises a plan to assist South Park with its emergent image problem. Randy thinks opening a Whole Foods supermarket would be a good way to instantly validate them as a citizenry that cares about stuff. Attendees of the town meeting are hopeful but skeptical: How were a bunch of backward country bumpkins going to convince such a progressive institution to open up shop in their junk-car filled backyard? The mayor goes on to assure the non-believers that the development of SodoSopa, a quaint centre of artisan shops and cafes situated in the poorest part of town (i.e. 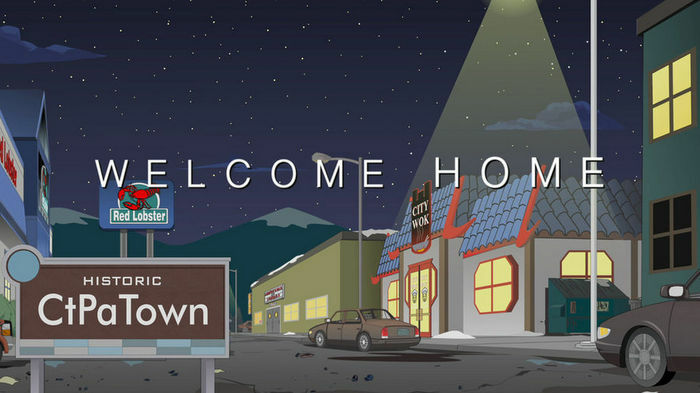 next to Kenny McCormick’s house) would lure the Whole Food’s franchise to South Park and ultimately disentangle the town’s new found socially conscious ideals from Mr. Garrison and his loudmouthed political incorrectness. When Kenny’s dad voices concern over the proposed revitalization, the Council promises him that the lower income families will not be priced out of the area and that they were going to take the time to do the project right. Much to the delight of the middle class residents, the SodoSopa contractors are super efficient and South Park is not left waiting an age for access to Asian fusion noodle houses, niche cheese shops, and hip microbreweries. Unfortunately for the McCormick’s, they can’t afford $10 ice cream; thus the family is unable to get a scoop of that tantalizing SodoSopa joy that’s being served up right outside their door. Having achieved what they set out to do, the committee ceases channeling funds into the development of SodaSopa and the project collapses. With the crowds gone, the McCormick’s can enjoy peace and quiet but the vacant and decrepit buildings surrounding their home have devalued their land. This is certainly one of the more poignant and depressing, yet heartwarming, South Park’s I’ve ever seen. 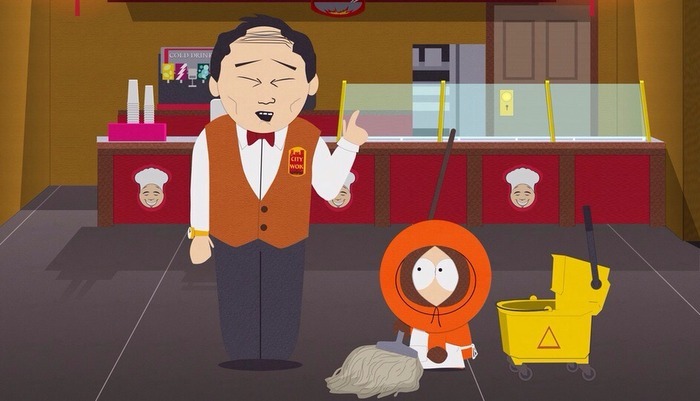 At the end of the episode Kenny returns home from his shift at City Wok and is scoffed at by his father when he tells him that he didn’t earn any money. Kenny then goes into his little sister’s room and gifts her with a doll of her very own, which he was able to buy with his child labor wages. Three episodes in, season 19 continues its winning streak. This entry was posted in TV Reviews and tagged Matt Stone, South Park, Trey Parker, TV Reviews. Bookmark the permalink.